The more observant of you might have noticed a new hair care, colour and styling line in the local pharmacies. The products come in brightly coloured containers and look very kawaii. 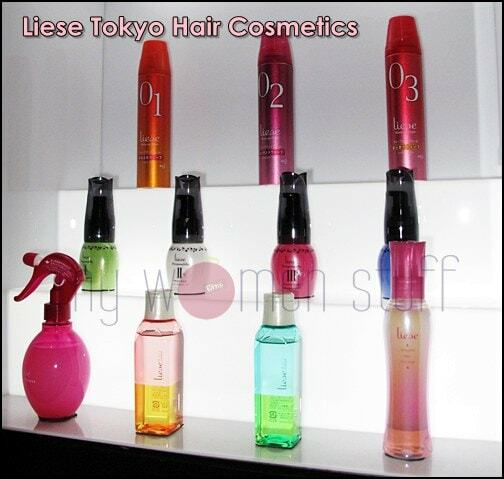 This is the new Liese (pronounced “li-say”) hair line by Japanese cosmetics giant, Kao. Well, the brand isn’t new in Japan – its new here in Malaysia. Liese is apparently the No. 1 styling brand in Japan and they work in partnership with Japan’s hottest hairstylist Mr. Hiroki Miyamura to create products that allow women to create gorgeous self-styled hairstyles at home. Under the care range, Kao Liese has the Liese Juicy Shower – a hair hydrating mist that comes in an adorable fuchsia pink spray bottle. Just as you would mist your face to cool it down on a hot day, you will use this Juice Shower to spritz on your hair to freshen it up and over time, help it stay softer and smoother. At rest, it looks a bit like a eye makeup remover – it comes in 2 layers of water and oil. Before using, shake it up and it turns into a cloudy emulsion that I like using either as a hair serum before blow drying. My hair always feels smoother after that and I believe it helps keep it from getting damaged. I also sometimes use it after blow drying my hair, or in the morning before leaving for work. Its light, non sticky and keeps my hair frizz free. I would suggest that it will work better if you have dry hair because otherwise, you might feel its too oily and might weigh your hair down. I’ve tried Bubble Hair Colour twice now and both times, i’m impressed with this product. I have stubborn, thick hair which color is difficult to penetrate through and at the salon i usually have to wait extra long for the color to set in. This is one reason why i used to always rely on my stylist for hair coloring matters. I’ve tried to color my hair with several brands in the past at home however it all ends with me feeling terribly ‘cheated’ and disappointed. Usually, i see not much of a color. Just a light tint of color only under strong sunlight. However, with Liese Bubble Hair Color with it’s bubbling concept, i couldn’t resist and tried home coloring again. And this is the first time ever that i’m thoroughly happy that it actually works and gives my hair a fresh coat of color that is pretty accurate to what you see on the box. 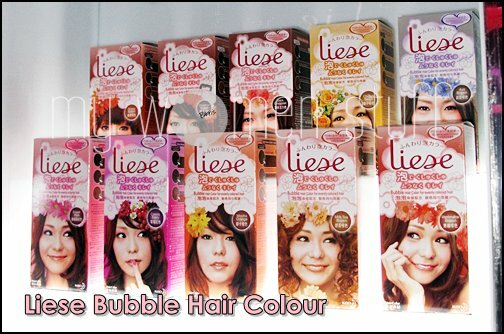 Think in the meantime i will be sticking to my liese for now instead of coloring at the salon. Would love to try out the Juicy Shower!! can’t find it at guardian n watson …jusco duno yet..
I’ve seen it at Guardian KLCC – probably starting at the bigger stores and working their way down to the smaller ones. i might want to try the bubble color coz it looks so fun! and i find that coloring hair at home is actually less damaging to my hair compared to the saloon one. That hair cocktail looks pretty interesting! Oooo PB..ur reviews aren’t doin my wallet any good..but does a LOT of good for me soul! Hehehehe. I love the hair cocktail! The smell… mmmm… The designing jelly is not too bad either but I haven’t really tried my hands at “styling”. Juicy shower is the most attractive one in the lot but I only started using it today. haha. I’m quite keen on trying the hair dyes! I just bought the Juicy Shower today because my hair is dried out after coloring and I don’t think it smells like cough syrup =D In fact I think it smells great! I’d really like to try the Bubble Hair Colour! At what price is it selling? 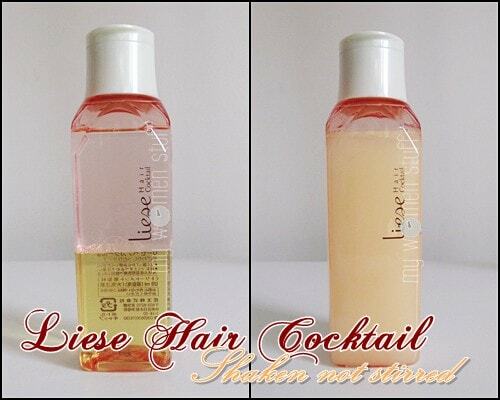 I really wanna try the juicy shower and the liese hair cocktail. But I don’t know which one is right for me. I have damaged hair as I used to straighten it. And now it’s really frizzy and sometimes it gets sticky. And I also have hair fall problems :S Please help! i just bought the juicy shower today , because my hair is to dried and to weak..and i hope this product will make my hair so moist and look health . One facts that make me attract to by this is because the smell so fruity .